Too Many Thoughts: "Last night you got see the show ...?" "Last night you got see the show ...?" This exhibition is what I've been working on since mid-July. I wanted to call it, "Last night you got see the show ...?" 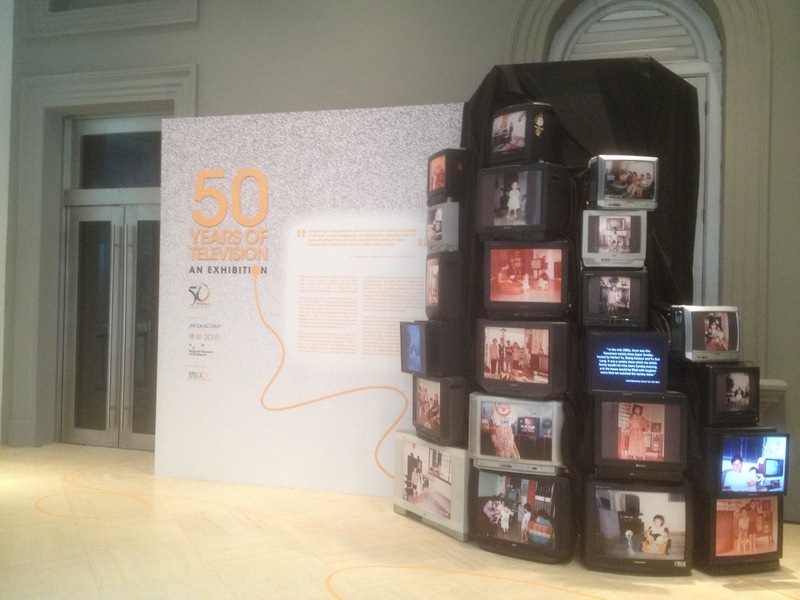 But the government isn't wild about using Singlish so prominently in the work it commissions, so we wound up with the more ho-hum, factual title: "50 Years of Television: An Exhibition". It's running in the Stamford Gallery at the National Museum of Singapore until 19 January 2014. It's the first exhibition I've co-curated (i.e. researched and conceptualised from scratch with the museum), so it's pretty exciting. It was also nice that I got to work on a slice of Singapore's cultural history that hasn't been widely researched or written about. A big shout-out to my tireless researchers Eisen, Kim Chai and Sahara for their hard work, as well as to Dr Liew Kai Khiun, Phillip Lim and Karthik for their expert advice. 1) There's a rarely-seen clip of footage from the legendary press conference by Lee Kuan Yew on 9 August 1965, the day Singapore officially became an independent nation. Yeah, yeah, we've all seen the overplayed bit where he calls it "a moment of anguish" and cries. That's not in the exhibition. Instead we've drawn out a really interesting moment right at the end of the press conference, when after an hour of answering the reporters' questions about foreign policy and trade, Lee says, "I would like finally, if I may, just to speak not to you but really to the people of Singapore." And he turns to face the camera squarely for the first time in the press conference and goes into a shpiel about what independence means for Singapore. He doesn't look down at his notes, he doesn't look anywhere else. For several minutes, he just talks to the camera, to this strange new medium, introduced to Singapore just two years ago --- and through that medium, to the people he imagines will watch the recording several hours later (there was no 'live' television broadcasting in Singapore then). I wonder if the thought flitted across his mind, or across the minds of any of the aides or journalists or TV cameramen present, that 48 years later, people might still be interested in watching this footage. Anyway, go to the exhibition and watch the excerpt. It's not all I wanted to do, in terms of presenting a critical look at the moment (of 1965) and the medium (of television) --- but it's definitely an overlooked moment in Singapore history that's worth a little more attention. 2) Another cool clip we found was of a sketch by iconic local comedians Wang Sa and Ye Fong, performed in 1973 at the tenth anniversary of the launch of TV in Singapore. What caught my eye (and, more importantly, ear) about this skit is that it could not be broadcast in full today because the entire premise of the joke relies on wordplay in multiple languages, including Chinese dialects. Since the government started the Speak Mandarin Campaign in 1978, Chinese dialects have been pretty much verboten on public radio and TV. In the skit, Wang Sa and Ye Fong are exulting in the multilingual abilities of Singaporeans, and the notably multiracial audience is laughing along gladly. Even though the clip in the exhibition is subtitled, I'm not sure it will get the same response today. Which begs all sorts of questions about the Speak Mandarin Campaign, language policy and general inter-intelligibility in Singapore. 3) There's a short video on the Yam Ah Mee meme of 2011. The meme was triggered at the time by Yam's official appearances on TV as the returning offier with the job of announcing the official results of the hotly-contested general elections. Then it was metatasised by social media into what Darryl Kang called "the most unlikely star of the 2011 election". 4) There are TV magazine images from the 1980s up to the present. No better way to revisit how long-time TV fixtures like Huang Wenyong, Xiang Yun, Chen Liping and Li Nanxing used to look. Bonus prize for spotting the cover of the very first issue of the Chinese Radio and TV Times (Dianshi Guangbo Zhoukan). Hint: it does not feature a local TV actor. 5) If you pay attention while you're at the exhibition, you'll hear the recognisable theme songs of landmark 1980s TV shows like The Awakening (雾锁南洋, 1984) and Good Morning, Sir (早安老师, 1989). I don't know about you, but even though I don't remember a single scene from The Awakening, when I was working on this exhibition, every time I saw a photo related to the show or was writing some text about it, the opening chords of the theme song would soar operatically into my consciousness. Most unlikely earworm, ever. Damn, it's in my head now. The exhibition is free and open daily from 10 am to 6 pm till 19 January 2014. If you see it, let me know what you think of it.